The Bowling Games will be on Sunday, May 5th at Mission Bowl 'n Olathe at 1020 S. Weaver St, Olathe, Kansas 66061. BOWLING: We encourage bowlers to bring their own ramps. The Games provide some ramps, but not many. FOOD AND SOCIAL: A continental breakfast will be served on Sunday at the bowling alley. PLEASE REGISTER EARLY! Please mail your completed forms as early as you can. DO NOT wait until the last minute to mail your ENTRY FORMS to us just because your medical form is not completed. Your Entry Form is our highest priority and is due MARCH 15th. Remember, we MUST have ALL completed forms and your entry fee before you will be allowed to compete. 2019 MID-AMERICA GAMES for the DISABLED, INC.
We are looking forward to seeing you at the 2019 Mid-America Games for the Disabled for the Bowling Events! 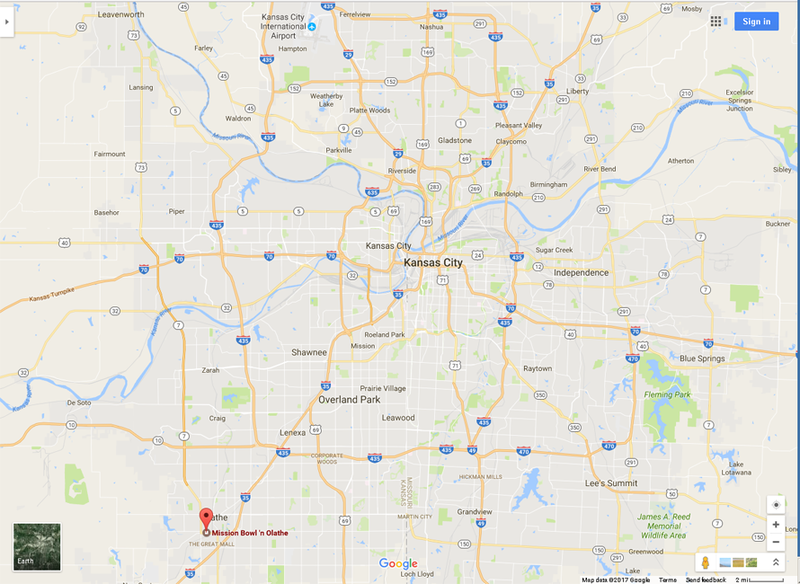 The Bowling Games are located at Mission Bowl, 1200 S. Weaver, Olathe, Kansas, (913) 782-0279.
ï¿½ Follow I-29 South until you reach the exit for I-435 South (after Parkville and just before the Kansas City airport (Mexico City Drive). Take the I-435 South exit. CAUTION: AS YOU APPROACH THE 90 DEGREE TURN AT I-435 TO THE EAST you will notice warning signs of ï¿½MAJORï¿½ construction at the I-435/I-35/K-10 interchange; follow the signs carefully to continue SAFELY and accurately on your journey! ï¿½ Continue on I-435 South (approximately 15-20 miles, give or take). I-435 will eventually (in Lenexa, KS) turn 90 degrees to the East. ï¿½ Very quickly you will see the sign for I-35 South. Take the I-35 South exit (right lane immediately after the Lackman Road exit). Stay to the right as the lane splits at the top of the ramp. ï¿½ Continue on I-35 South (about 2.5+ miles) until you reach the #217 exit, OLD HWY 56. Take that exit from the right lane. ï¿½ About 1.8 miles you will reach S. Weaver St. Turn right. ï¿½ You will arrive at 1020 S. Weaver St. on the RIGHT. ï¿½ Follow I-35 South all the way through Kansas City, Merriam, Lenexa, and almost through Olathe. ï¿½ Approximately a mile or less, you will reach the #217 exit, OLD HWY 56.
ï¿½ Follow I-70 East until you reach the exit for I-435 South. Take the exit for I-435 South. CAUTION: AS YOU APPROACH THE 90 DEGREE TURN TO THE EAST you will notice warning signs of ï¿½MAJORï¿½ construction at the I-435/I-35/K-10 interchange; follow the signs carefully to continue safely and accurately on your journey! ï¿½ Follow I-35 North until you enter Olathe, KS. Continue on I-35 North until you reach the exit for US-169 exit (right lane). Take the US-169 exit. ï¿½ Go North on US-169 (less than a mile) until you reach the intersection with OLD HWY 56.
ï¿½ Turn left on OLD HWY 56 and continue (less than 1 mile) until you reach S. Weaver St. Turn Right. ï¿½ The major route would be I-70. ï¿½ Follow I-70 West until you reach the exit for I-435 South (just past the Arrowhead Stadium on the left). Take the I-435 South exit. ï¿½ Continue South on I-435 (approximately 10 miles). I-435 will eventually turn 90 degrees to the West (it may be somewhat confusing so, FOLLOW THE SIGNS CAREFULLY! Continue West on I-435 until you reach the exit for I-35 (in the right lane). CAUTION: After you pass Metcalf, heading WEST, you will notice warning signs of ï¿½MAJORï¿½ construction at the I-435/I-35/K-10 interchange; follow the signs carefully to continue safely and accurately on your journey! ï¿½ Take the I-35 exit. The ramp will split into two lanes soon after you exit, go to the left (I-35 South). ï¿½ Continue on I-35 South (about 2.5+ miles) until you reach Exit #217, Old HWY 56. Take that exit from the right lave. ï¿½ In about 1.8 miles you will reach S. Weaver St. TURN RIGHT ON WEAVER STREET. ï¿½ You will arrive at 1020 S. Weaver Street on the right. ï¿½ The two major highways would be U.S. 71 in Missouri and U.S. 69 in Kansas. ï¿½ Follow U.S. 71 North until you reach the exit for I-435 West just to the North of Grandview, Mo. Take the I-435 South exit. ï¿½ Continue West on I-435 (approximately 10 miles). I-435 will eventually turn 90 degrees to the West (it may be somewhat confusing so, FOLLOW THE SIGNS CAREFULLY! Continue West on I-435 until you reach the exit for I-35 (in the right lane).